Jacob Blessing the Sons of Joseph, c. 1620, Guercino. On loan from the National Gallery of Ireland. Several months ago, a very large and beautiful 17th-century Italian painting arrived at the J. Paul Getty Museum. The painting is by Giovanni Francesco Barbieri (better known by his nickname, “Guercino”) and entitled Jacob Blessing the Sons of Joseph (1620). Part of the collection of the National Gallery of Ireland (NGI), it arrived safe and sound from Dublin for a two-year long stay at the Getty for conservation treatment and study. The painting has not been restored or conserved in a very long time—its present condition masks a great work of art behind layers of dirt, old varnish, and overly enthusiastic restorations that now dull and cover the original colors and wonderful brushstrokes. Yet even in this darkened state, it elicited gasps of excitement from art handlers, curators, conservators, and registrars when we unpacked it in the Getty’s Painting Conservation Studio. You might be asking yourself at this stage, “Why on earth did we transport such an important painting such a great distance for this work?” Let us explain. The National Gallery of Ireland closed two wings of its historic building in 2011. The NGI’s conservation staff have been extremely busy preparing their large collection for reinstallation into the refurbished museum building scheduled to reopen in 2017. 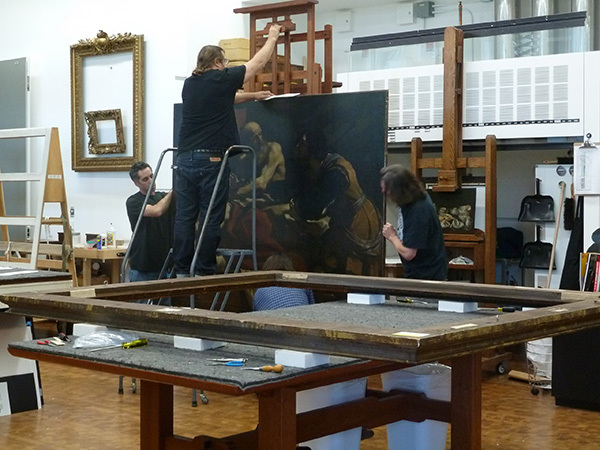 Within this tight timeframe, the Guercino’s importance and large size—over 5 feet high and almost 7 feet wide (170 x 211.5 cm)—made it a difficult conservation project to be undertaken in Dublin. 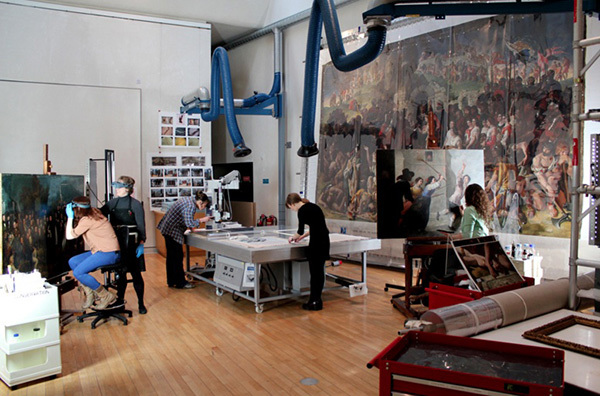 Conservators treat paintings in one of the National Gallery of Ireland’s conservation studios. And so it was that the NGI found itself with the opportunity to avail of a cherished program at the J. Paul Getty Museum. The Paintings Council, a group of generous individual donors, helps support the study and conservation of major art works from international museums and cultural institutions at the Getty; in exchange, the Getty enjoys the opportunity to display the paintings at the Getty Center for a few months after the completion of treatment. The NGI was open to investigating a collaborative project with the Getty and we started discussions in Dublin in the summer of 2014. We were all excited by the prospect of choosing an important work from their extraordinary collection to undergo thorough research and conservation treatment at the Getty. 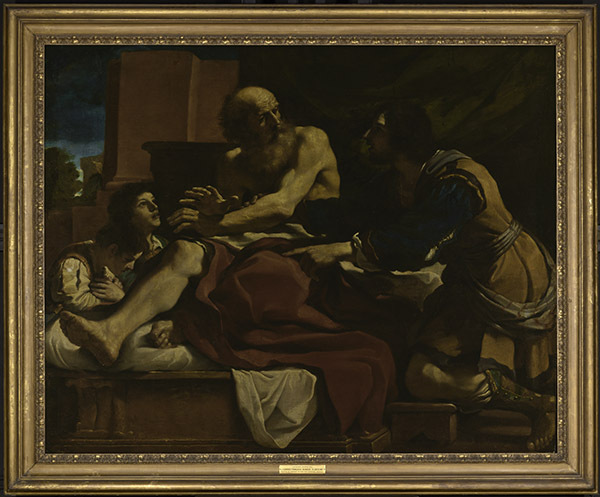 The NGI proposed Guercino’s Jacob Blessing the Sons of Joseph, an incredibly compelling painting that normally hangs beside Carravaggio’s The Taking of Christ in one of the remaining galleries open to visitors. There were several benefits of bringing this painting to Los Angeles, where it would enjoy access to all the resources the Getty has to offer. 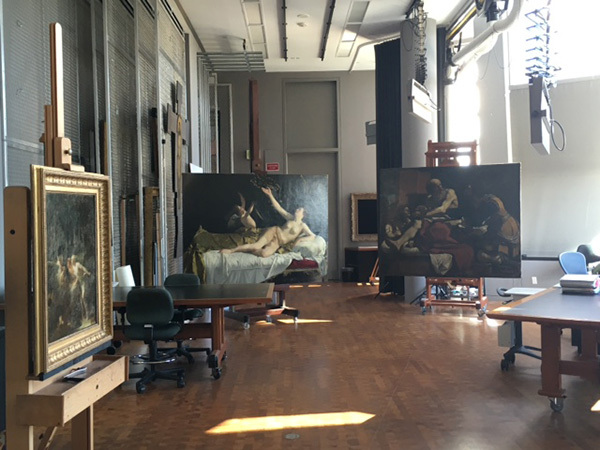 The paintings conservation studio could easily accommodate its size. 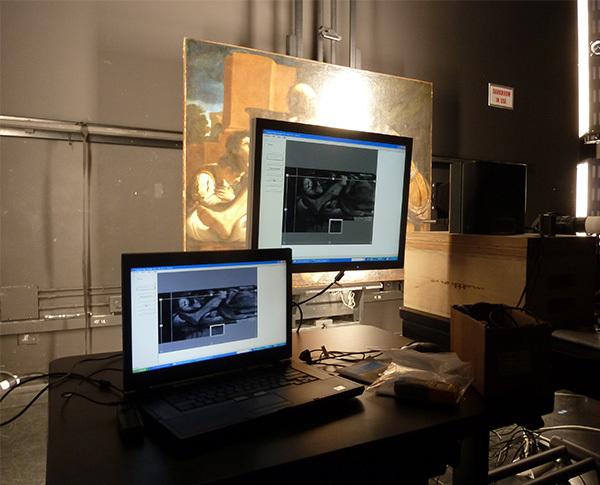 The Getty Conservation Institute could help with scientific analyses of the materials used in the work, helping us better understand the painting’s condition and how it was made. 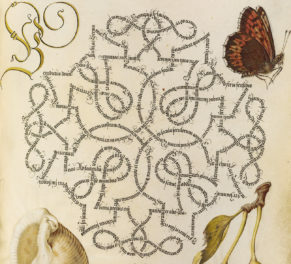 Furthermore, the expertise of curatorial staff at the Getty Museum and the art historical resources at the Getty Research Institute would allow for a full scholarly study of the work. We were absolutely delighted with the choice—what a wonderful (albeit temporary) addition this will be to the Getty’s collection! 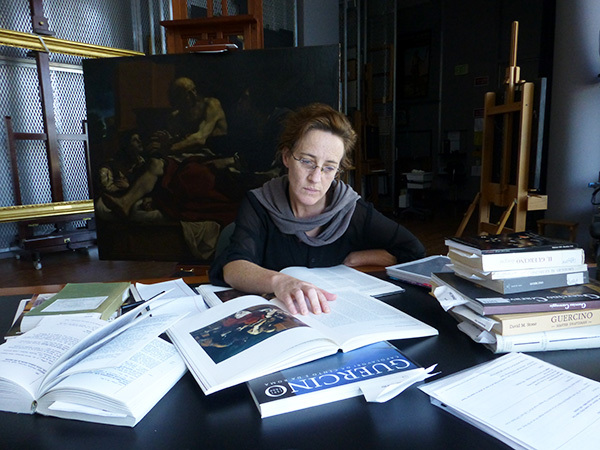 It is a great opportunity to contribute to our knowledge of Guercino and his work and to bring a painting of this quality to the Getty Center for visitors to enjoy. 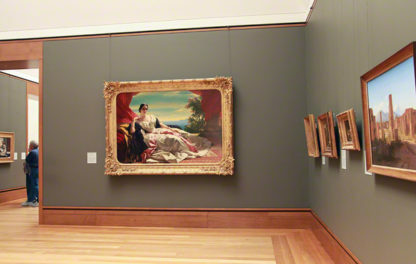 (The painting will go on temporary display after the completion of treatment, scheduled for 2017). Projects funded by the Paintings Council often involve a conservator from the lending institution accompanying the painting for a period of months. The guest conservator works alongside the Getty’s conservation and curatorial team, allowing valuable professional interaction and discussion to take place. 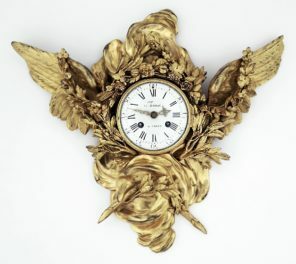 However, because of the NGI’s hectic schedule for the reinstallation of its collection, it proved difficult for even one member of their staff to come to the Getty for any extended period. Instead, a number of NGI’s staff shall visit the Getty for short stays periodically over the next two years and will keep in frequent dialogue with the Getty’s staff as it carries out the research and conservation. Getty art handlers place Guercino’s Jacob Blessing the Sons of Joseph on an easel. Since the arrival of the painting in Los Angeles, technical examination and research on its history has started. X-radiography, infrared reflectography, and other complex imaging techniques have been carried out to help determine its condition and its painting materials. Cleaning tests have also begun. Tracing the painting through history helps us understand when the last conservation treatment may have taken place. Through all of this, the painting is holding court at the end of our studio, intriguing all who see it despite its current condition. Living with the painting in this way is crucial before any actual conservation treatment is started, as it allows us to get to know the painting in so many different ways. Jacob Blessing the Sons of Joseph in the Getty Museum’s Paintings Conservation studio. At left is the Getty’s recent acquisition, Danaë by Orazio Gentileschi. Both institutions feel strongly that the details of such an important project should be shared with as many people as possible and a blog provides a perfect venue. Over the course of the two-year project, we will offer a peek “behind the scenes” at our studio and our work to share the details of this complex undertaking—we hope you will follow and enjoy! 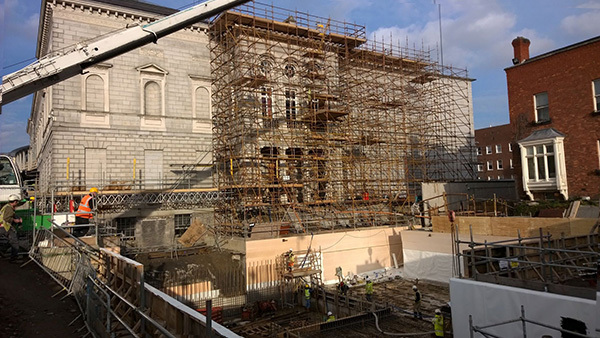 How exciting…what a tremendous adventure for the Getty and the National Gallery of Ireland.looking horward to following the blog. Fascinating article as always – so looking forward to seeing this glorious painting!